MUMBAI: Can one say, ‘A love story is a love story’? One cannot; how the story is told makes all the difference. Mughal E Azam, Barsaat, Aradhana, Dilwale Dulhaniya Le Jayenge, Kabhie Kabhie and Hum Aapke Hain Koun..!, among others, were all love stories but each was memorable for its own reasons. At the opposite end of the spectrum is the recent crop of South Indian-style formula love stories that have been raiding the box office of late. 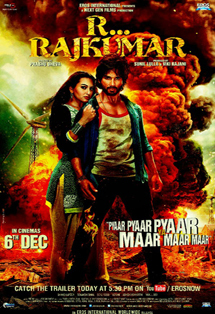 R… Rajkumar is one of them. It is a mindless action film in the guise of a love story, and not a very good action film at that. The villain loses his credibility too many times in a period of two hours 26 minutes to be of any interest by the time the climax comes about. The villain’s superiority, ego and power are all finished long before the final fight; all that remains is finishing him physically. And the film, already bankrupt of ideas, devotes 20-25 minutes just to that. It seems never-ending. Producer: Sunil Lulla, Viki Rajani. Cast: : Shahid Kapoor, Sonakshi Sinha, Sonu Sood, Ashish Vidyarthi, Mukul Dev, Asrani, Srihari, Poonam Jhawer; Charrmy Kaur and Ragini Dwivedi (both in special appearance in songs). Shahid loves to poke his nose into others’ business. Ashish Vidyarthi’s goons plan to kidnap truck carrying opium belonging to Sonu Sood. Shahid saves it and earns an entry into Sood’s gang. Shahid can tackle 100 goons singlehandedly, the goons being very sporting as they tend to be in all South Indian action choreography. They always attack one after the other, each waiting his turn. Sood is thoroughly impressed and Shahid is promoted to his right hand man, displacing Mukul Dev who is also a sport and, instead of hating Shahid, makes him his best friend. Shahid’s reason for staying around in the town is probably Sonakshi as he has fallen head over heels for her. Soon, Shahid has a competitor. Sood sees Sonakshi and is besotted by her. She turns out to be the orphan niece of Sonu’s enemy, Vidyarthi, but so what? They decide to bury the hatchet and become rishtedaars. Challenges are thrown and a fight sequence is in place when Shahid leaves the scene. He could have taken Sonakshi along at that very moment but he avoided doing that for the sake of taking the film into the second half and eventually to its never-ending climax. No sense ending a film at interval stage. In the absence of anything worthwhile, the second half is whiled away with songs, some action and some cell phone romance besides unsuccessfully attempting some Himmatwala, Mawali kind of funny sequences with Asrani, Poonam Jhawar, Vidyarthi etc. Prabhu Dheva is handicapped as this time he is directing an original and not a remake; he is totally at sea! The film has one item number which is popular with masses in Gandi baat… The background score is eardrum shattering cacophony. The editing department seems to have been passed over. Action is routine South brand where the hero is superhuman. Besides, every action sequence has been stretched as if to make up for the lack of content. Shahid does a tapori role he is not cut out for. Just growing stubble does not make one a tapori. Sonakshi is too large for the frame. She is unimpressive in all that is expected of her. Sood is routine while Vidyarthi, Srihari, Asrani and Poonam Jhawer pass muster. Mukul Dev makes his presence felt. R…. Rajkumar has nothing to offer to multiplex audience and, may be, three days’ worth to single screens before it ends its reign. Cast: : Farooq Sheikh, Sarika, Raghubir Yadav, Satish Shah,Sharat Saxena, Tinnu Anand, Vineet Kumar, Suhasini Mulay, Zareena Wahab, Himani Shivpuri, Viju Khote, Harsh Chhaya, Mona Wasu. When a personal tragedy is juxtaposed with comedy, when underlying emotion in every person’s life is camouflaged with vibrant humour and still a maker comes out with an entertainer, the concept is the hero. Such is the confidence in the script that the cast is made up of half a dozen veteran 60-plus actors; in fact, casting is the mainstay of the film. 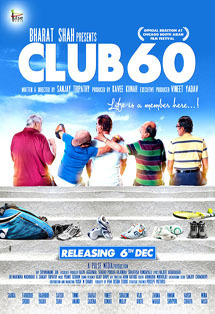 Club 60 is one of those films which come as a breeze of fresh air. It joins the category of Vicky Donour, OMG Oh My God, Dirty Picture, Kahaani and Special 26 as a rare gem. In short, it is not just another run-of-the-mill movie. Farooq Shaikh, a neurosurgeon of repute in Pune and his wife, Sarika, also a doctor, are in depression and mourning having lost their only son in a shootout in a cinema hall in the US where he went to study further. To leave their son’s memories behind, the couple has moved in to the very flat they had bought for their son’s future use in Mumbai after folding up their medical practices in Pune. While Shaikh is totally shattered and even tries to commit suicide once by slashing his wrist, Sarika contains her pain and loss within herself and tries to be a support to Shaikh. While Sarika joins a local hospital to keep her mind from the tragedy, Shaikh refuses to divert his attention and prefers to wallow in his sorrows. Then, a few days into his Mumbai life, there comes in his life a storm called Raghubir Yadav. Yadav lives in the same building, a floor above Shaikh. He dresses in t-shirts bearing suggestive messages, branded sunglasses, half-cargoes and Nike shoes. He is a gaudy, loudmouthed, overenthusiastic Gujarati who believes in living his life to the fullest but also forcing it on to others. After as short ride in the lift with Yadav, Shaikh has had enough of him. He decides to keep Yadav at arm’s length and also advises Sarika to do the same. But Yadav is not easily contained. He soon invades the Shaikh household, force-lands on breakfast table and invites the couple to join Club 60. While Yadav irritates Shaikh, Sarika finds him quite amusing and does not totally reject him. Yadav wants Shaikh to come look up the club and with little help from Sarika, he manages to do so. Yadav manages to involve Shaikh in his club along with four other friends, Sharat Saxena, Satish Shah, Tinnu Anand and Vineet Kumar, who are as boisterous as Yadav. At the club, their life revolves around a tennis court where they play little, abuse and fight each other more and finally settle down for their favourite finale, breakfast followed by a fight over who pays! Everything they do is like any group of boys in teens would be doing. Shaikh is a witness to all this camaraderie but aloof. Within a generally well-thought-out script, there are two scenes, both involving Sarika that stand out for being thought provoking. One is her talk with Shaikh’s psychiatrist, Harsh Chhaya and another with Shaikh, both of which are better seen on screen. The scene with Shaikh changes his attitude, turning him from a loser to a positive man. As Shaikh comes closer to the five people in the 60 plus group, he learns that he was not the only one to have lost someone close to him. All five around him had a sad story to tell which they hid behind their boisterous bravado and loud demeanour. They did not indulge in self pity like Shaikh did. Sanjay Tripathi has written and directed this film, his debut. He has excelled on both counts. Despite dealing with two shades, tragedy and comedy, the film’s dialogue is effectively relevant. The songs, composed by Pranit Gedham, besides being well penned, take one back to the melodious 80s. Background score is effective. Performance wise, Sarika tops with Shaikh and Yadav (who could have been a little less loud) also do very well. The other four, Saxena, Shah, Anand and Kumar give a natural account of themselves. Suhasini Mulay, Zareena Wahab, Himani Shivpuri, Viju Khote, Harsh Chhaya and Mona Wasu are fair in support. Club 60 is a small budget film with still smaller budget for promotion. Its hopes rest on word-of-mouth, failing which the business will sadly go to pirated discs because, the film is an entertainer with human story and the word is bound to spread eventually.